The STEALTH ULTRA HD Soundbar Series represents the world's first universal high performance plug and play sound system for side by side's, golf carts and just about any mobile application. The patent pending design is built with a full extruded aluminum housing which looks similar to our Rogue 4 led light bars. All STEALTH models feature a full range speaker array plus additional titanium dome tweeters for dynamic output and performance. Now with an ALL-NEW RF Wireless Remote for full control from steering wheel cradle. The STEALTH ULTRA HD Soundbar Series is powered by a full range class D amplifier with integrated Bluetooth connectivity, auxiliary inputs, 2 volt line driver output to link to another sound bar or to add external amplifier and speakers, waterproof connector, universal L mount brackets for end cap mounting or sliding top mount channel system, auto turn off feature to save battery life, back lit led illuminated control panel and a fully integrated wiring harness included. 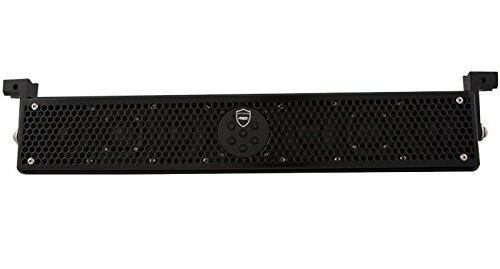 The STEALTH-6 ULTRA HD Soundbar is a 6 speaker-180 watt unit with 4 full range drivers and two 1 inch titanium tweeters. The STEALTH ULTRA HD Soundbar Series is true High Performance plug and play stealth audio system! If you have any questions about this product by Respirapro, contact us by completing and submitting the form below. If you are looking for a specif part number, please include it with your message.